Wearing a police badge and blue uniform is something Cory Schweitzer has always dreamed of doing. "I've always wanted to help people and be out in the community," he said. "I grew up in Anne Arundel County, I went to school in Anne Arundel County, my uncle works in the department so its just always where I've wanted to be." 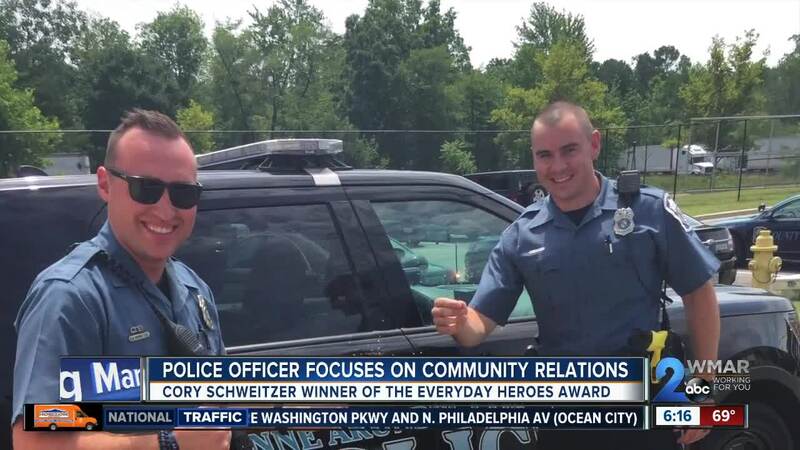 Schweitzer has fulfilled his dream of being a member of the Anne Arundel County Police Department. It's important to him to be out on the streets as much as possible. "Unfortunately, the media and social media don't give us the best image, but when people get out and meet us in person it does change their perspective," he said. At a time when relations are strained between the police and communities across the country, Schweitzer's colleagues say he's doing what's necessary to mend those broken ties. "We really preach for officers to get out of their cars and engage community members and that's something that Cory's very good at," said Lt. Ryan Frashure, the spokesman for Anne Arundel County Police. When he's not patrolling the streets, Schweitzer is on the ice. He is a volunteer assistant coach for the men's ice hockey team at the Naval Academy. He's also coached youth ice hockey teams and sponsors midshipmen who are far from home. "It feels like 30 with the whole hockey team," he said with a smile. "People coming in and out of the house during all of the holidays. If they don't go home, they come to our house." This past March, Schweitzer participated in a charity ice hockey match called the Annapolis Heroes Classic to raise money for an Annapolis firefighter who was battling cancer. They raised $12,000 to help the firefighter with medical bills. "Without a doubt Cory was a great pick up for us, he's great guy off the ice as well. We're lucky with the team we have, and Cory is a direct reflection on that." said Matt Benoliel, the team captain for the Annapolis Chiefs. His police colleagues say the volunteer work Schweitzer does outside in his spare time has an impact that's felt well beyond the ice rink. "Even when he's not in uniform, it shows that we have a different side, a human side and our chief preaches that all the time to just be human," said Frashure. Schweitzer is the winner of the Chick-fil-A Everyday Heroes award. Click here to nominate a person for the Everyday Heroes award.